A key reason behind St Kitts’ recent rise has been Jacques Passy, installed as head coach by the SKNFA midway through last year. Born and raised in Mexico City, he never played football growing up but obtained his first A Licence at 19, with coaching certificates from Mexico, Peru and the Netherlands. 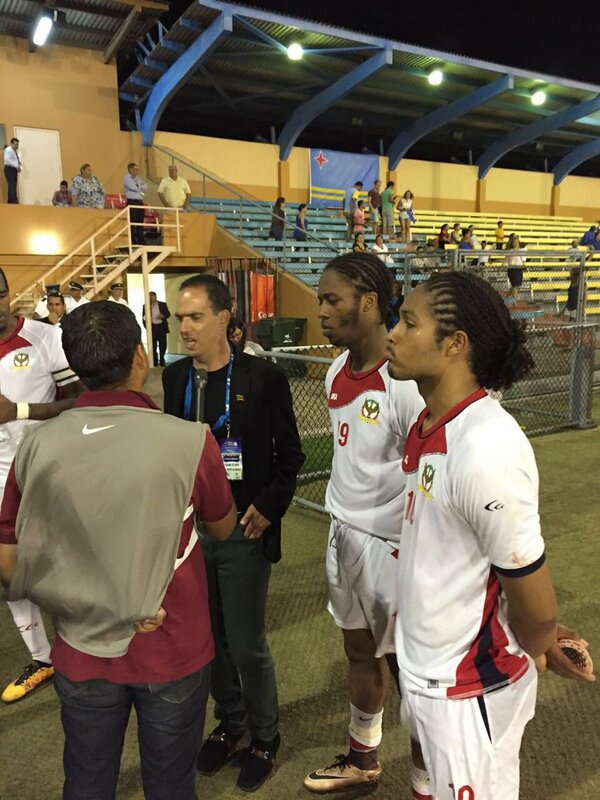 Before signing up with the St Kittitian FA, the 40-year-old previously guided Mexico to their first gold medal at the 2003 Maccabiah Games held in Chile. He took over during the 2018 World Cup qualifying campaign as the Sugar Boyz held El Salvador to a draw before falling to defeat in the return leg. Ever since Passy has presided over one of the most successful spells in the country’s history. In November, he arranged for the squad to go on a European tour as St Kitts played friendlies against Andorra and Estonia, their first ever matches in Europe. They ousted the former 1-0 to become the first Caribbean team to beat European opposition on that European opponent’s home soil before losing 3-0 to Estonia. They followed that up with an excellent Caribbean Cup qualifying run: they’ve taken maximum points from all four qualifiers so far, winning their last three 1-0. For all St Kitts’ progress, however, there is nothing truly tangible to show for it yet. They sit 81st in the latest FIFA rankings – their highest ever position – which ranks them 7th in CONCACAF and 3rd in the Caribbean, behind traditional heavyweights Jamaica and Trinidad & Tobago. The Sugar Boyz have been one of the most impressive sides throughout this year’s Caribbean Cup qualification and qualifying for the CONCACAF Gold Cup, the region’s flagship event, would represent a breakthrough moment for St Kittitian football. Standing in their way are Haiti and French Guiana, who will be the opposition for the final round of qualifiers set for early October. Haiti are the group favourites and will be fresh from playing World Cup qualifiers a month before, while non-FIFA French Guiana are a growing force and will call upon several players from France. “I’m sure they’ll be tough games, but we know what we have to do and are all feeling very motivated – the players, staff, hierarchy and most of all the nation as a whole,” explains Maynard. As warm-up for those matches, the SKNFA have arranged an away friendly with Nicaragua in Managua on 31 August. Note: This article also appeared in In Bed With Maradona. Thank you for reading! Feel free to leave any constructive feedback in the comments box below. Big up to Jacques, Atiba and Lois for answering my questions. Meanwhile, you can get in touch with me on Twitter, Facebook and Instagram. Passy must be careful, having 28 players on his radar is a very large amount, he must be mindful of the backlash that he or the team would receive if he ever has a squad with no home grown player in it. I must say that he is doing a good job at the moment and I hope we continue to move up the rankings, very nice article by the way, keep up the good work. Thanks for the feedback! I can’t say this for sure, but I’m pretty certain he realises that striking a balance is important so doubt that the team would ever be 100% comprised of diaspora players. He seems very clued up tactically and has seemingly got the players on board; they’ve bought into his ideas. The matches against Haiti and French Guiana will be tough – of course they will – but they should feel confident about their chances.